The United States Mint just received an early Christmas present. The agency was gifted the freedom to increase the purity of its 10-cent, 25-cent and 50-cent silver coins. 2015 Silver Proof Sets include 90% silver coins. Future sets are expected to have .999 fine silver coins. Until President Obama signed the FAST Act into law on Friday, Dec. 4, the U.S. Mint had to produce silver coins for numismatic products like annual proof sets in a composition of 90 percent silver and 10 percent copper. The Mint for years has wanted to make them in .999 fine silver. It now has that authority with tweaks throughout U.S. coinage law that replaced the traditional 90/10 language with "not less than 90 percent silver." The changes open the door for higher purity coins and the Mint plans on walking through it. CoinNews expects to hear from Mint officials soon on when the move to .999 happens. The decision is not as cut and dry as expected. The San Francisco Mint had already started striking 2016-dated silver coins in the 90/10 mix before our last visit in October. The Mint would have to scrap those, which would seem unlikely, continue to make them along with .999 fine examples, or simply wait and make the changeover in 2017 or later. A 90% silver and 10% copper ratio is often referred to as "coin silver." The 90/10 mixture was a mainstay of U.S. circulating coins from the early 1800’s until the Coinage Act of 1965 became law. Its use returned in 1982 for modern commemorative coins and in 1992 with the introduction of annual Silver Proof Sets. The new mandate does not apply to commemoratives, but legislation for recently proposed silver dollars has included the more flexible composition language. In terms of quality, the Mint has found that the copper in 90/10 alloy exceeds the maximum solubility of copper in silver and can cause coin spots and hazing, which drives higher scrap rates and customer returns. The "excess copper precipitates out of solution and can cause a build up on the dies or could cause a harder blank surface," a Mint document describes. "The finished product displays varying amounts of breakup spots and haze." .999 silver also flows better under pressure. That results in superior fills and fewer strikes to make collectible coins. The U.S. Mint indicates that while the material cost is lower for 90/10 alloy, the efficiency, quality and manufacturing improvements gained from .999 fine silver are offsetting. There is also a larger supply base for .999 fine silver blanks since they are easier and cheaper to fabricate then custom-made .900 fine silver blanks. The FAST Act includes other coin-related provisions like edge lettering for 2016 Silver Eagles and a stronger call for one-ounce coins in .9995 fine palladium. Great, detailed update on your previous article on this exciting topic! Thanks again. 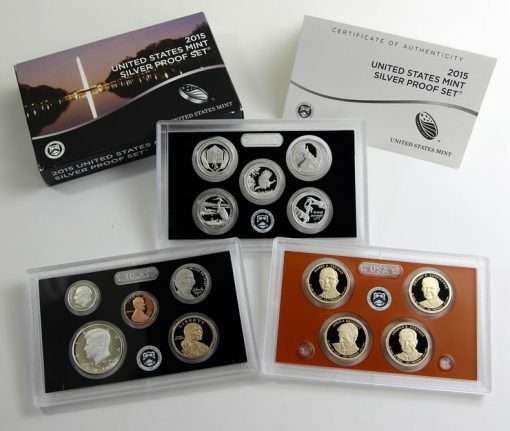 Speaking of silver coins, do you know of any updated news on the packaging problems for the 4th year in a row on the 2015 Limited Edition Silver Proof Sets & their issue date? This is such a nice presentation set for gift giving during the Holidays for sure. Hope it is issued soon! With the FAST Act, changing the cumbersome packaging of bullion Gold Buffalo coins in heat sealed flat plastic sheets having 20 individualized compartments to much more convenient 20-coin plastic tubes would be an improvement. Sounds like a basis to JAck up their price$ 2me……. 10% for the purity after all its for the kids…of Obama! How many more oz of silver need to make annual Silver .999 proof sets? will it push up Silver price? My average cost of buying Silver eagle bullion are over $30+,!!! 2011 silver Panda sell at over $45 each , ASE selling at $22? 2016 What the Hell China Panda ONLY 30g , and selling at $25? Why is the Mint even concerned with manufacturing costs when they charge such a large premium for proof sets? Silver is low enough right now that this hopefully won’t jack the price up too much, though you never know. They should look really good, if kept air tight. The metal is soft enough that details could really stand out. But it certainly is the last step away from the traditional composition. Interesting that they skipped sterling (92.5%) entirely. Waiting till 2017 does make the most sense–having both “high” and “coin” silver grade proof sets is unfair to collectors, and mixing them together would drive people batty. Hope that this law will allow silver winged liberty dimes, standing liberty quarters and walking liberty halves in silver. Would love to have these in addition to gold next year. When do you think the liberty gold coins will go on sale? The article eludes to the fact that the savings in manufacturing costs will offset the increase in silver cost per coin. The .999 blanks are easier and cheaper to obtain (cost less). So we can hope that these cost reductions (in Coin production costs) will be passed on to the collector. In addition, the real “added bonus” for coin collectors is the reduction of “Milk Spots” that can appear on coins years after purchase (even in sealed graded holders). So they needed the alloy back in the day to make the coins last longer. Now that silver only goes into numismatic coins that need goes away. The firsts will be important for collectors and then interest in their uniqueness will wane. Was there anything in the legislation about eliminating the penny??? Or the $1 bill??? The last part of your comments is a fantastic idea! (Get rid of the Lincoln cent & $1 Federal Reserve Note & replace with a new $2 or $5 coin with Lincoln’s portrait) I lived in Germany for 3 years in the late 1970s & they had a 5-Mark coin with a face value of about $2.50 U.S. dollars. It was a good thing as coins last about 30 years or more in circulation while the current $1 note only lasts a little over a year in circulation! It simply is insane for the Mint to continue to lose money on every cent (& 5-Cent coin too) it strikes because Congress will not change a broken system. You can get rid of the nickels if you get rid of the dimes too. The US economy will not come to end if all business is transacted in quarter dollar increments. $20 bills are the “dollar” of our present-day economy so replace the $1, $2, $5, and $10 bills with coins. Keeps the cash registers (for coins anyway) with the same five coin set-up. Would also make coins spendable again and worth the effort of picking up. Maybe add back the $500 and $1000 bills to fill up the bill slots though I loathe the idea of a customer coming in to pay with one of those for a $12 order. I think your answer is politics, politics, politics. Seth, Vachon, Jim: Your insights are very much appreciated. Maybe it’s a case of misery loving company, but I’m glad to see I’m not just a lone voice bemoaning our political dysfunction. If paralysis runs so deep that something as simple as coin and bill designs get knotted* up for decades, it’s no wonder big-ticket issues like infrastructure and energy can’t be addressed. (*) I was going to use a different verb, but this is a family site! I’ve only been ‘collecting’ (Hoarding) for over 60+ yrs. My main gripe is not silver versus copper/nickel coins or the excessive premium charged by the mint for their massive amounts of ‘Special’ coins, but that of coin designs. It seems that there are a multitude of “committees” that have to decide on design before the coin goes into production. True, the U S took a “Top Choice” for a coin for 2014 (Baseball), but Canada and Australia’s coin designer have always put the U S designers to shame and will continue to do so. They’re more interested in selling coins to collectors than the US MInt is. But then again they probably aren’t selling millions of 1 oz silver coins like the US Mint is either.